Happy Friday everyone. Hope all that celebrate Halloween had a fun time tricker treating and such. Today’s momoko is 02SPpk. She is the special Hara Museum version. 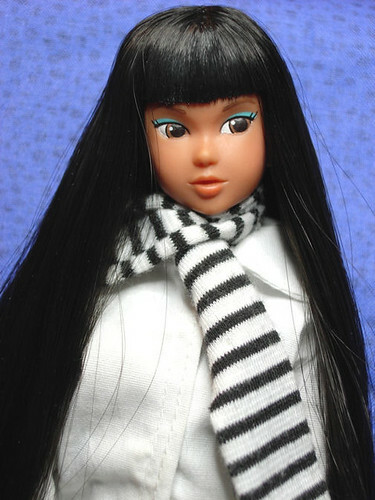 There were five versions of this doll. Basically the same doll with different color shirt dresses and shoes. 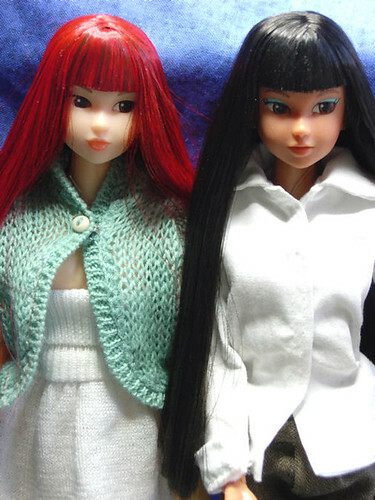 Their hair is slightly different on each doll too. I found her off Yahoo Japan and for some reason no one else bid on her so I got her for close to the original list price. She’s turned out to be a favorite. She’s so much cuter than I was expecting. I love it when that happens! 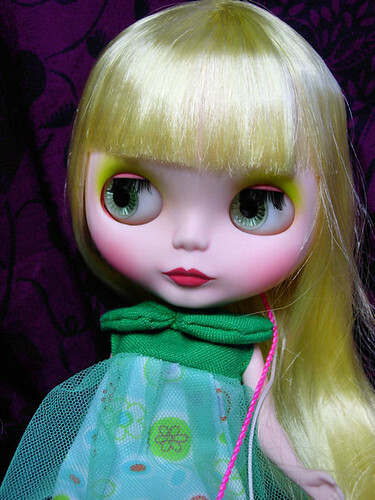 I finished a Blythe custom. It started out as my own project. I like to think about whether I’ll sell the doll or not but a customer said if I was doing a blonde one she’d buy her. I was already re-rooting this one in blonde. She came back to me and said she would buy her and then sent me a deposit so it turned into a commission. But I still got to go with my original ideas for the most part as the customer trusted my tastes and doesn’t like to “direct” the artist too much but instead let the artist decide. So… here she is and there she went. Off to her new mommy. I’ll get to see pictures of her and maybe at a meet in the future. It’s always fun to see what the customer re-dresses the dolls in. She has been completely re-rooted. She started off as a Hello Harvest and has airbrushed make-up, repainted lips, new eyelashes and her stock eye chips were switched around. Also sleep eyes were added. Well that’s all for now. Have a great weekend! As I said, I would profile my Petwork’s girls. So here’s the first one in the series. She hasn’t had much photo time since I got her during the super busy period of commission overload. This is 02KF. 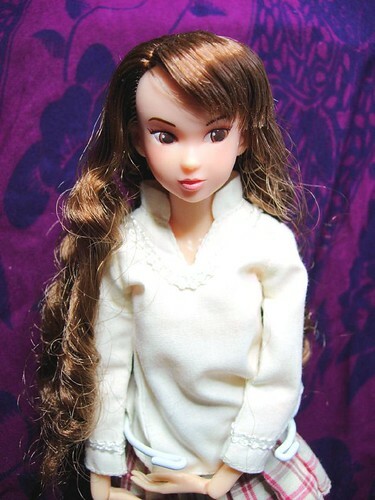 02 meaning she was produced in 2002 and KF for Korizu Factory- doll fashion designers making colorful feminine somewhat folksy dresses and accessories. I do wish their creations were more readily available but I think you have to be in Japan to buy their stuff or something. I lucked out and got her in a trade. Time flies and then I realize I haven’t updated in a while. I decided to take some pictures so here’s my Momokos of the day. I also took pictures of all my Petwork’s Momokos and will profile each one that I have. I found out through taking these pics that I have 12 of these original beauties. I really do prefer them to the Sekiguchi model and will probably thin that collection a little bit. Of course, many are candidates for customs. There’s just something about the Petworks and now Close Clipped Sheep dolls that make them so alluring. They’re are definitely better quality as far as the heads go and they just have a clean simplicity and innocence. 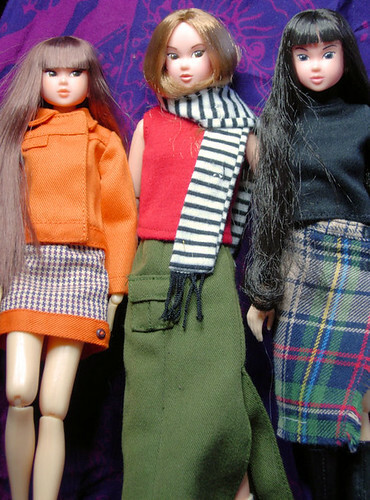 Sometimes the Sekiguchi dolls look too made-up for my taste. On the customizing front I’ve got several works in progess and am finding it difficult to get at least one of them completed. The Blythes in particular have been giving me trouble. My black Blythe doesn’t want to hold the special paint on her body so she stays on the back burner untill I can get the paint on the legs just right. 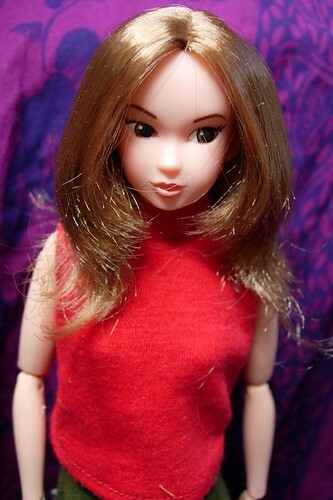 I ran out of hair on a custom Hello Harvest that I was re-rooting and then yesterday I was trying to airbrush her make-up and either would screw it up or just when I had it right the paint would get scratched. I ended up having to completely remove my hardwork and start all over again this morning. Finally I was fresh enough to get it right and now she just waits on more hair. I can’t wait to get her done and post pictures. She’s quite the stunner! A customer has already laid claim on her so I don’t get to keep her and it might sting a little to let her go. But hopefully, she’ll be thrilled as that’s the best reward for me. I finish off with a picture of my DaBi wearing Blythe Closet Fashions. We did a trade and I must say both of us are very satisfied with our trade. YAY! Well it’s been crazy busy here trying to do too many things at once. This is the last Beach Rodeo in a string of commissions. I think I did upwards of seven Beach Rodeos out of all the re-roots in the past 2 1/2 months. She’s a real popular one who’s original stock is pretty underwhelming but with new hair and style she really stands out. On the Blythe front, I’m making up for lost time as I take a break between commission projects. 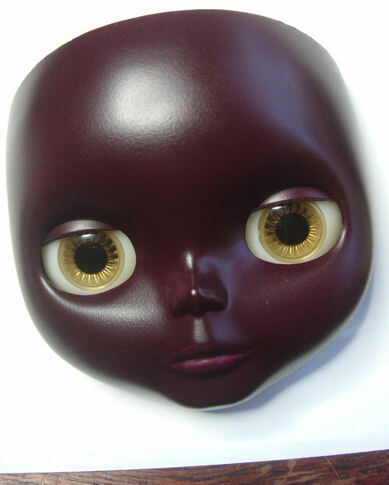 I’ve got a few works in progress re-rooting one, dyeing hair on others and my first black blythe. Here’s her sneak peak. I’ll definitely be doing more of these delicious beauties. I have to also do one just for me if I ever get the chance. I’ve been customizing a Tailor Gibson as well. I dyed her hair and gave her a bob. I also gave her all new make-up and changed her chips around. I’m not sure if she’s done yet. I may try to get her hair darker but not sure. So as you can see the past week was a busy one. I also made a new dolly friend and had a dolly meet with her. She sews and in fact calls herself Sewpixie and makes the cutest dresses which she’s finally offering up for sale. Till next time, have a happy dolly week!